Normally, I like to make my pillows with removeable covers, for ease in laundering. 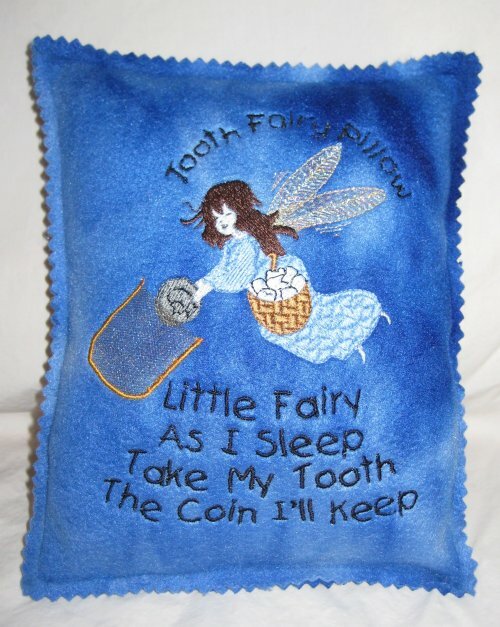 But, I figured that a Tooth Fairy pillow isn't going to get a LOT of use, so I used a very easy construction technique. After all the embroidery was done, I simply backed the embroidered front with another piece of fleece (wrong sides together) and stitched around the sides, leaving an opening to put the stuffing through. Once the pillow was thoroughly stuffed, I completed the line of stitching. Then I used my pinking shears to create a decorative edge outside the stitching line. Oh, and for the actual pocket, I used a small scrap of sparkle polyester organza, cut on the bias (so it has a little bit of stretch to it). So, let's see if I can figure out where stuff came from. 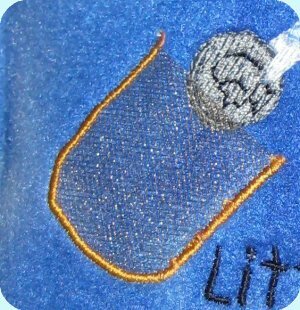 a link for the wording specifically digitized for use on fleece! Now .. *really* ... how fortuitious can that be?? Everything is still available on a single page at no charge. Wowsers.